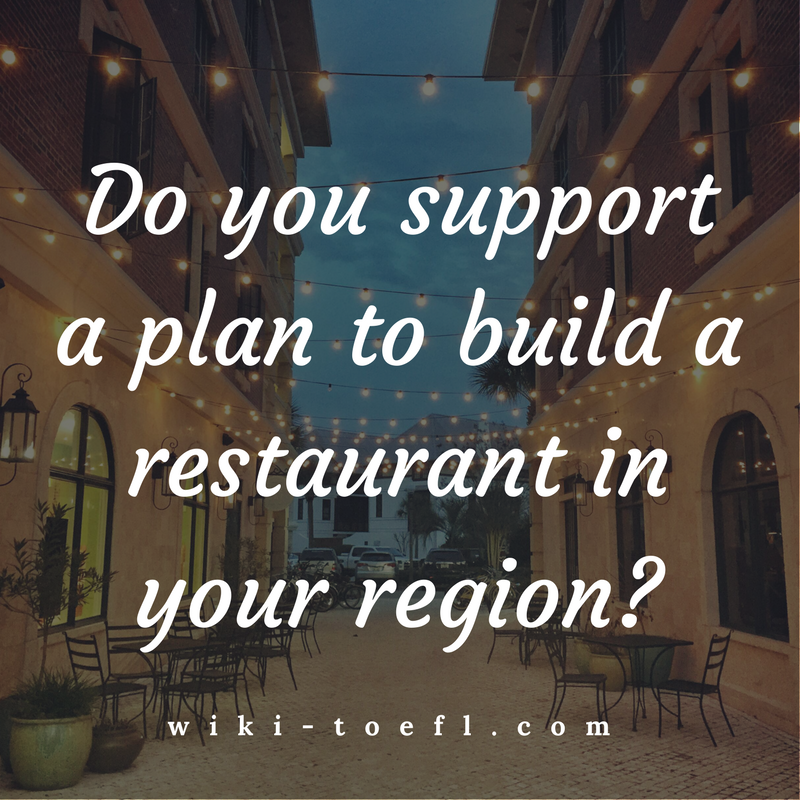 Home Writing	Do you support a plan to build a new restaurant in your neighborhood? It has recently been announced that a new restaurant may be built in your neighborhood. Do you support or oppose this plan? Why? I can see both advantages and disadvantages to having a new restaurant built in our neighborhood. I’m worried about traffic and how it will affect our neighborhood. However, I think that it will benefit local businesses and increase appreciation for our neighborhood. Overall, I think it is a good idea. Traffic congestion is always a concern when you build something new. Our streets are narrow, with parking on both sides. More cars traveling through the neighborhood could cause a lot of congesting. Traffic means parking problems, too. Our neighborhood has very few garages attached to the houses. Most of us depend on finding a space to park on the street. If the new restaurant is built, we’ll be competing for those spaces with the restaurant’s patrons. Plus, if the restaurant offers wallet parking, it’ll be even worse. Valet parkers work in teams to grab every possible space available on the street. I’m also concerned about the type of patrons this new restaurant will bring into our neighborhood. A family restaurant wouldn’t be a problem. However, if it’s going have a bar and dancing, then there could be problems. The restaurant would stay open later, and people leaving the restaurant might be drunk. Who wouldn’t worry about rowdy customers staggering around our neighborhood in the early morning hours, looking for their cars? I have to admit, though, there are advantages to a new restaurant. Our neighborhood could certainly use the jobs the restaurant would provide. Not only that, the money neighborhood residents would earn there would likely be spent at other neighborhood businesses. This would give a boost to those businesses and make our neighborhood more prosperous. A new restaurant would also attract a lot of people to our neighborhood. They could see what a nice area this is to live. That might attract new residents to the neighborhood. That would be a good thing, because we’ve been losing residents to the suburbs the last couple of years. There are a lot of details to consider, but all in all, I support the idea of this new restaurant in our neighborhood.